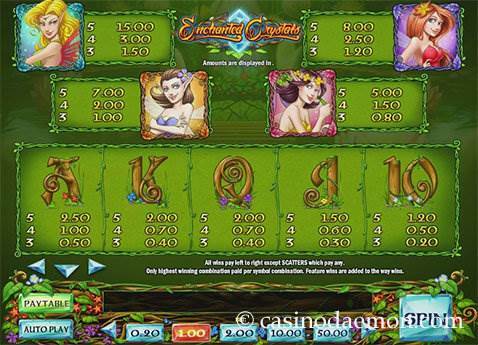 The fairy themed slot game Enchanted Crystals takes you into a magical forest, and you have to help the fairies and protect them from the evil goblin king who is trying to steal their crystal. The graphics of the game are beautifully drawn, and the developer put a lot of thought into details of the images. You can find the goblin king, butterflies, crystals and many different fairies for higher paying combinations, and the A, K, Q, J and 10 symbols in wooden design for the lower paying combinations. The music is uplifting and creates a very happy atmosphere in the game. 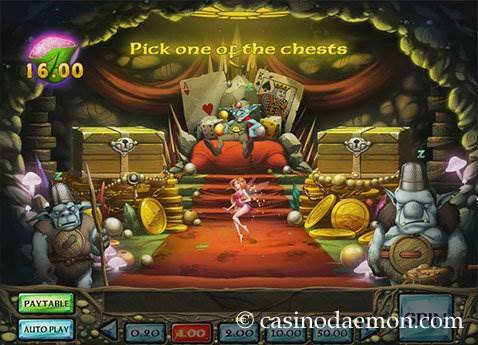 The game is a sequel to Enchanted Meadow and offers an interesting bonus game with the goblin king's treasure chamber, as well as free re-spins and up to 50 free spins with extra wild symbols. The variance of the game is medium, and you should regularly win smaller and larger amounts. However, as the game focuses on the free spins and bonus games it should be played for while, so that you will get the chance to trigger one of these bonus features. Most of the prizes can be won during the bonus games. The average return to player is at 96.72%, which is relatively generous for an online slot game. You can also play Enchanted Crystals mobile on different devices, for example iOS and Android devices are supported, as the game is available in HTML 5. You can play Enchanted Crystals for free here and experience the demo version of the game. If you like it you can play it for real money at one of the online casinos you can find on this page. The wild symbol is the crystal and it can replace other symbols for winning combinations. The wild can appear on reels 2, 3 and 4 and it expands to cover the whole reel. You will also get a free re-spin during which the wild is held in place. You can get up to 3 free re-spins. The bonus game starts when you get three symbols with the goblin King. In this bonus game you can win up to 500x your total stake if you manage to go through the whole game and find the crystal. 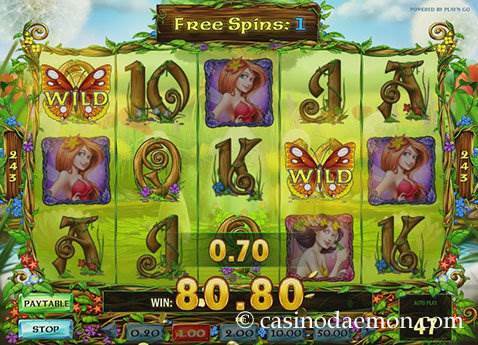 The free spins start with three butterfly symbols. During these you will get 10 free spins, and you can get additional free spins, up to 50 in total. What makes the free spins really good are the butterflies that can land on the reels and turn up to 5 symbols into wild symbols. As you can see, the game has a lot to offer, and when you play it you will notice that the special features trigger relatively often, which provides for great entertainment and a good chance to win some cash. 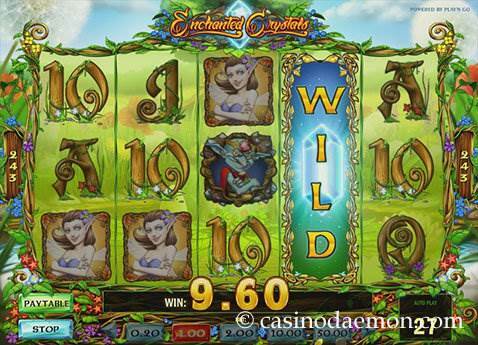 The online slot Enchanted Crystals from Play'n GO has 5 reels and 243 ways to win. This means that symbols have to appear on adjacent reels starting from the first left reel, and not on dedicated pay-lines. The game doesn't offer many different stakes, the lowest is 0.20 £/$/€, and if you want to play more you can select to play 1, 2, 10 or 50 £/$/€ per round. Automatic play is also possible.